I finished the second of three draft stoppers yesterday. (No. 1 draft snake is here and draft snake no.3 is here)My plan is to make 2 draft stoppers in September and 1 in October. I am trying to do this inexpensively. 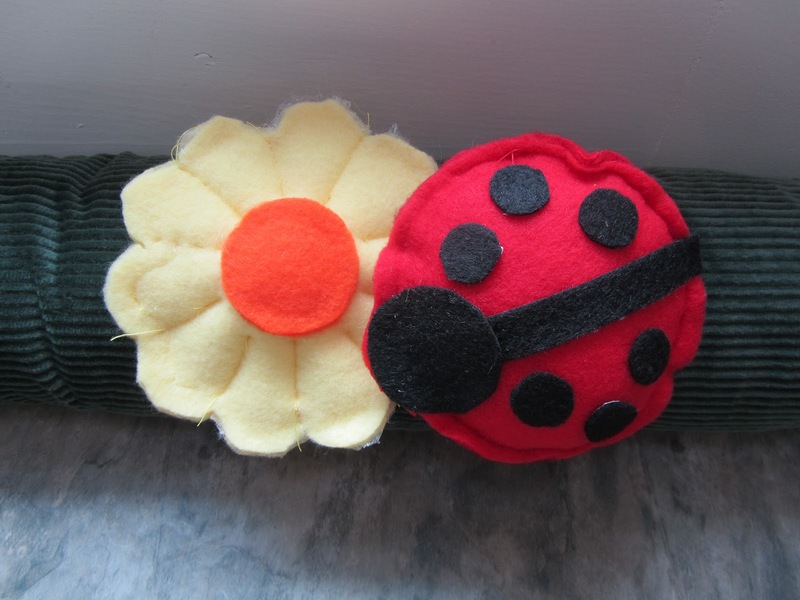 But on this one, I did get picky about the details, and spent about $1 on fleece for the lady bugs and flowers. I had some fleece already, but needed pieces of red and yellow. So, not as cheap, but this draft stopper is for the kitchen door to the deck. I spend a lot of time in the kitchen and I wanted something to remind me that spring and summer will indeed return. I had a long strip of the green corduroy leftover from a lap throw for the family room (made several years ago). And the green actually goes quite well with our kitchen. I didn't plan that, it was just one of those serendipitous things. 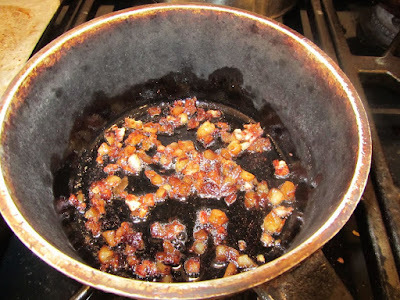 I still had some of that tattered comforter, as well as batting, for the innards of the snake. My fabric strip was wider than the last piece, so I went ahead and made this one quite fat. I did the ends differently than the last draft stopper. If you remember, the last one had candy-tied ends. 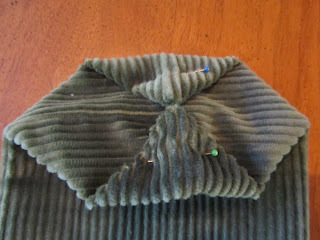 This one, having less length in fabric, I decided to cap the ends in the same manner that I do the tops of fleece hats. 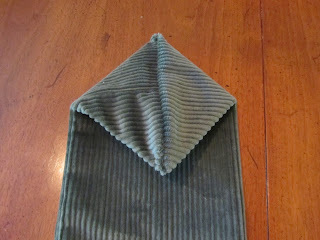 For the first end, I flattened the fabric and made a straight across seam. Then I turned the fabric right side out. I folded the pointy ends of that seam inward, towards each other, and tacked in place. This sort of squares off the ends. The final end, after stuffing, I did in the same manner, but sewed it all by hand. 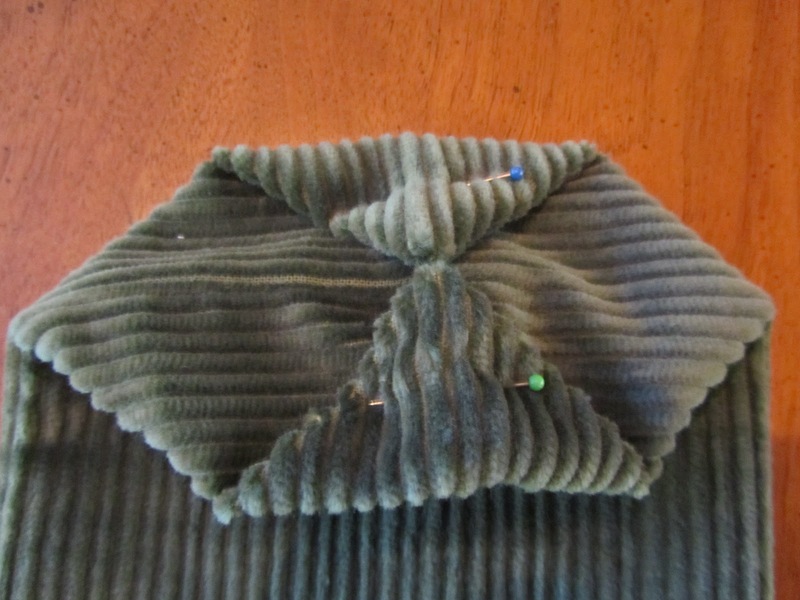 I made the straight seam with a whip stitch, then tacked the two pointy ends together. To make this festive, I adorned the draft stopper with ladybugs and flowers made of fleece, and held on by velcro (so that I can wash the case when it gets dirty, without harming my spring decor pieces). When I make something creative like this, I use everyday items for templates. For the ladybug body, I traced around a small coffee can lid. 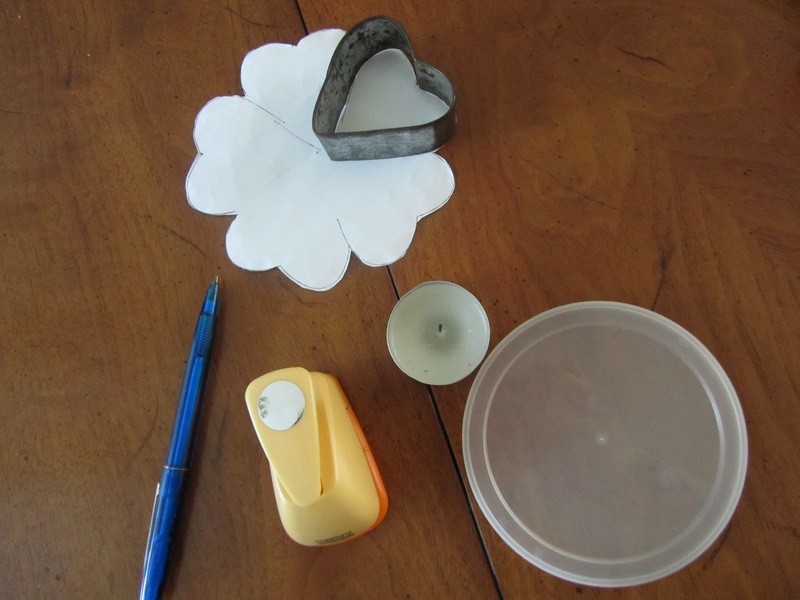 For the black ladybug head, I traced around a small votive candle. And for the dots, I had a large, circle hole punch, which didn't quite cut through the black, sticky back felt. 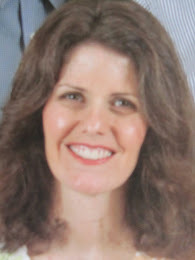 However, it marked it well enough that I could cut them out with scissors. The flower was a bit of a challenge at first. Then I thought to make a daisy-like flower using a heart-shaped cookie cutter. I traced hearts onto a sheet of white paper. At first, I tried 4 hearts, but that looked too much like a clover. Next I tried 6 hearts, but that made the flower too large for my fabric piece. Last I traced 5 hearts in a ring and they seemed to make the best flower. Then I cut out this paper flower and used it for a template for the yellow fleece. You may wonder how I intend to hold my stoppers in place at the doors, without weights inside. I plan on either double-stick tape or velcro. Double-stick tape would be cheap. But velcro would allow me to align the draft snake easily after moving it to use these doors (which by the way, in the cold months, we don't use these doors all that much). For the draft snake I'll make in October (for the front door), I do plan on adding weight to it (with sand most likely). That door gets used a lot, and I want the weight of the snake to hold itself in place. I'm making progress. It's little bit by little bit, in my efforts to make our house snug and cozy. I know I won't get to everything this year. But if each year I work a little more towards getting the house in shape for cold weather, it'll happen some year. My other task for this fall is to seal up the 4 remaining old windows in the house. One is a large sliding glass door. Any suggestions on how to make that one more snug? There are insulating drapes on it, but still it gets quite cold in that room. Very good thinking to attach the lady bugs and flowers with Velcro so the snake can be washed. Thanks! I know they wouldn't make it through the wash.
"window" of then sliders. This is a metal frame so it should adhere well. I then plan on using white duck tape to adhere a large, 6 ml plastic panel over the entire door. It will become somewhat opaque but this is a South facing slider, and light won't be an issue. A large draft dodger will fill the void in the track to the left (before applying the plastic), and another will be placed t the base of the slider. I also plan on putting a set of insulating drapes over this window, currently being used temporarily in another room until I finish the curtains for that room. Thanks for all your info. I'm going to do the foam insulation strips where the two parts of the slider meet, as well as the other 3 edges of the moveable door. There's also a drilled hole, about 3/8-inch in diameter, in the metal frame, where the original owners had thought to install one of those locking pins, but go the hole in the wrong place. I'm going to plug up this hole with insulation foam. I'm hoping doing these things will make a difference. I also have a Queen-size comforter for this window that goes behind the curtains. 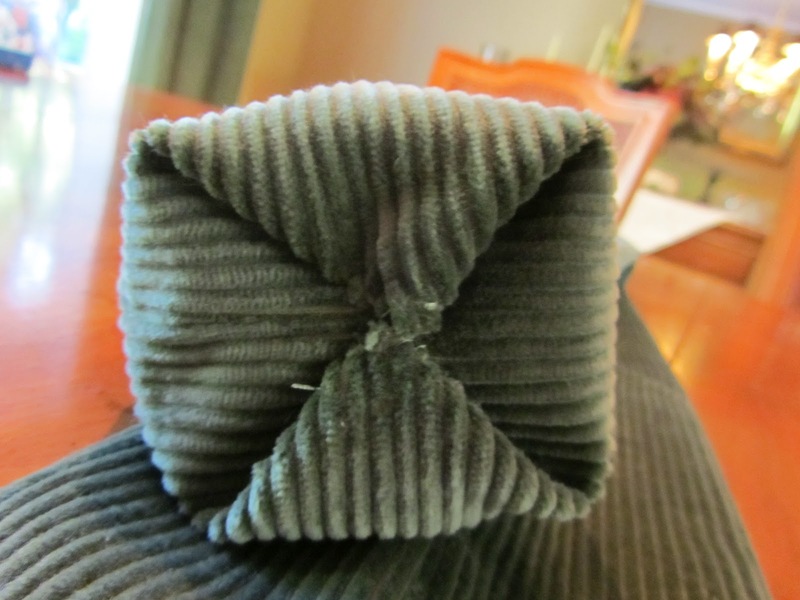 I sewed plastic rings to the top edge of the comforter and put cup hooks across the top edge of the casing around the slider, to hold the comforter. Not my favorite solution, as it's difficult for me to open it for light during the day. But it helps for the coldest months of winter. Really cute! Our current place doesn't have any sliding glass doors so we're set on that. Not sure what I would do if we did. I have however toyed with the idea of making quilted drapes for the main area. The kitchen, dining and living area are one great room and three drapes would do the trick. quilted drapes that open and close would be very cozy and insulating I'd think for your area. Your winters are not too harsh there, right? It's nice to have a great room that you can keep all snug for the coldest months. 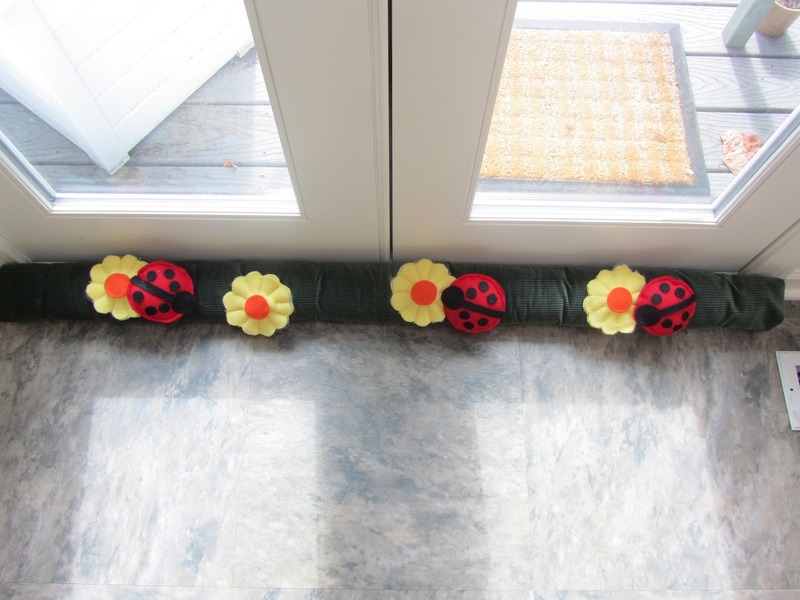 I have gotten my front door weather sealed and the bottom is actually so tight I don't need a draft snake, but this is so cute I may have to make it for my son's house. I love the ladybug and may steal your idea for his as well. Next up on my list, if it ever stops raining long enough is to add sealant to the cracks along the outside of the large window. Thanks! I love ladybugs, they look so cheerful to me. Caulking around that one slider is another thing I could do for that room. I'm sure it hasn't been caulked in years. I wonder if there's a water-based caulk that works for outdoors. The last time I caulked I used one that needed a solvent for clean-up, and that left me with a terrible headache. I tend to avoid anything that will trigger a headache, including dusting -- oh, my! the dust is thick in the house this week!